Stayfree Pad With Wings 28-Pads is designed for women to provide a feel of dryness during menstruum. 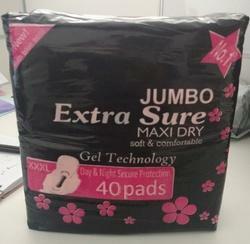 It has a cottony soft cover with a high absorbency to soak the wetness during heavy flow. The best feature of these pads is that they come with wings to prevent leakage and perfectly fit at its place. Asanitary napkin, sanitary towel, sanitary pad, menstrual pad, orpadis anabsorbentitem worn by awomanwhilemenstruating, recovering fromvaginal surgery, forlochia(post-birth bleeding), after anabortion, or in any other situation where it is necessary to absorb a flow ofbloodfrom thevagina.